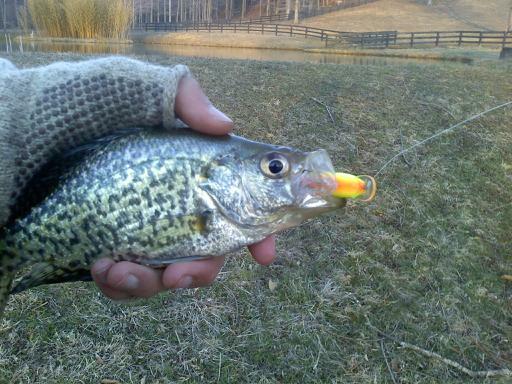 Yesterday I went fishing at my neighbors ponds again, to see how the crankbait bite was...I caught 2 bass pretty quickly on a 3" Rebel Floater. I was fishing on a 1-2 foot flat when a fish struck about 1 yard away from the bank. I missed the fish, and the bait came flying out of the water, connecting with my rod around an inch below the tip. I heard a loud crack and to my dismay, the first guide as well as an inch of my rod had slid down the line and was sitting on top of my bait. Talk about an abrupt halt to good fishing. I headed back to my house, quickly grabbed another rod, and headed back to the ponds. I managed to catch two more bass and a crappie, which was surprisingly dark, which must mean they are close to spawning. Anyways, today I went to Dicks Sporting Goods and picked up a new rod, a Field and Stream 5'6" Ultralight Tec Lite. I am going fishing in the morning before school to "break it in" and I will give a report on how it works if I can catch some fish. A firetiger Teeny Wee-R was the bait of the day.